California Consulting LLC Presents at Westside School Districts Meeting in Kern County - California Consulting, INC.
California Consulting LLC presented at the Westside School Districts Meeting in Kern County on December 9, 2015. We are happy to have Lakeside Union School District as one of our newest clients! 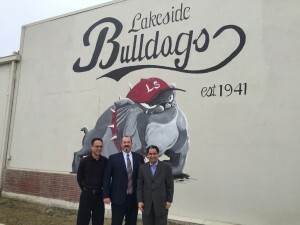 Pictured: Matthew Park, Business Development-Kern County, Ty Bryson, Superintendent, Lakeside Union School District, and Steve Samuelian, President, California Consulting.